Last Friday was World Photography Day and we were asked to reach for our camera to capture something special for this week's Gallery. Now last Friday was a day of baking and tidying as I was taking the children away to see family. So the children had a day of free play at home occupying themselves. 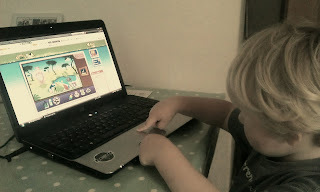 As a treat they were allowed to use the laptop to play cbeebies games. This shot of the youngest gives me mixed feelings. It makes me smile as he is getting on independently but also makes me sad as he is growing up too fast and is already mastering technology. It will be interesting to look at this image in years to come to see how outdated that laptop is! Great picture! Kids these days do literally have technology at their fingertips from such an early age. It does make me wonder what the world will be like when they are our age.. Interesting shot, my son who is 3 can use my iphone, better than my partner and as well as me. I can't imagine how things will be once he is an adult. Technology is everywhere you can't escape it! I have mixed feelings about it too - especially when you read they are only supposed to watch TV/go on computers for 1/2 hour. I turn things off in the day but half hour goes very quick! They have to be competent with technology though - that's what the world is now. They will have jobs we can't even imagine. Cbeebies is a great site though. I'm quite happy with the content on it being suitable - with no adverts. Thanks for your comments. Who knows what our children will be doing technology wise in 10 years!